In the final days of the 2008-09 term, the Wisconsin Supreme Court decided Tensfeldt v. Haberman, 2007AP001638 (July 14, 2009). Although the factual situation is somewhat complicated, bear with me — it has some important family law and ethical implications. This article summarizes its holding, with an emphasis on the family law aspects; next week, I will take a critical look at its repercussions. According to the decision, Robert Tensfeldt had three children with his first wife, Ruth. When they divorced in 1974, they entered into a marital settlement agreement that provided, in relevant part, that Robert would execute a will leaving two-thirds of his net estate to their children. The agreement was, as these agreements usually are, approved by the court granting the divorce. In 1975, Robert married Constance and remained married until he died in 2000. Robert and Constance had no children together. Ignore the judgment and risk an estate challenge on his death. Perhaps figuring that what happened when he dies is not his concern, Robert chose the third option and LaBudde drafted a will disregardind the judgment. In subsequent revisions of the will, Robert continued to ignore the provisions of the divorce judgment. When LaBudde retired, Robert used the services of Attorney. F. William Haberman of the same firm for advice concerning his estate, Haberman failed to inform Robert about a new development in Florida law that would allow Constance to elect against the will. The effect was to increase Constance’s share of the estate at the expense of Robert and Ruth’s children. It was undisputed that Haberman was negligent in failing to inform Robert of the change in the law, but did not know about the divorce agreement. When Robert died, the children commenced a probate action in Florida to enforce their rights under the terms of the divorce judgment. The trial court upheld Constance’s election against the will and found that the childrens’ claim was barred by the 20 year statute of limitations for judgments. On appeal, however, the Florida appellate court held that the 20 year statute of limitations did not apply since the judgment was based on contract. 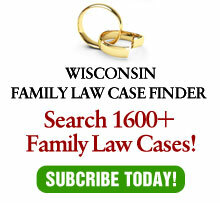 Eventually, the children settled with Constance, but then commenced the instant case in Wisconsin against LaBudde and Haberman, alleging negligence and intentional torts. Dane County Circuit Court Judge Michael C. Nowakowski determined that, as a matter of law, LaBudde aided and abetted Robert’s violation of the divorce judgment. The trial court also determined that the civil conspiracy and negligence claims against LaBudde presented questions of fact for the jury to decide. However, the court dismissed all claims against Haberman, concluding that while he was negligent as a matter of law, the evidence that his negligence had actually caused harm to the children was speculative. The children appealed and LaBudde cross-appealed. The court of appeals certified the cross-appeal to the Supreme Court. The Supreme Court, in a 4-2 decision written by Justice Ann Walsh Bradley, affirmed in part and reversed in part. The high court rejected LaBudde’s argument that the judgment requiring Robert to create a will in favor of his children was unenforceable because the divorce court had no authority to incorporate a stipulation for property distribution to children. The court held that there is no restriction on who can be the beneficiary of the parties’ voluntary stipulation for a division of the estate. The court recognized longstanding law that even where a court does not have the authority to impose a certain order, the parties may voluntarily stipulate to do so and the court can incorporate their voluntary stipulation into its judgment. Therefore, Robert was obligated to follow the court’s judgment unless it was modified in a proceeding in the circuit court or on appeal. The court dodged the specific issue of whether the 20 year statute of limitations on judgements bars the tort claim, finding that it did not need to decide this issue since the alleged tortious conduct occurred between 1980 and 1992 – within 20 years of Robert’s death in 2000. Next week, I’ll take an analytical look at these issues and the court’s decision. For now, I’ll say, I’m extremely grateful for that footnote.